SERIES 600 is one of the most space saving range's on the market. 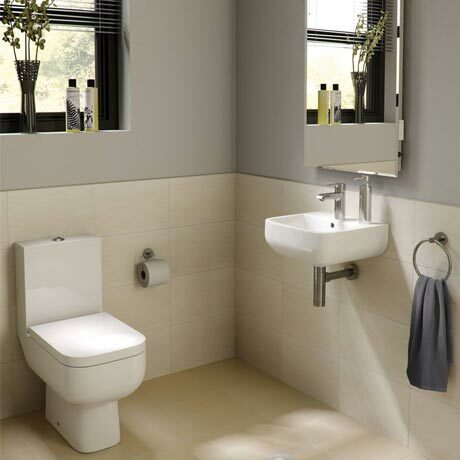 The toilet and basin have a great compact design. Despite its contemporary styling and air of quality it is incredibly affordable. Please Note - All taps, wastes & bottle traps pictured are for display purposes only, all taps and accessories are sold separately. Q. Is the seat soft closing? Hi, this RAK Series 600 seat is not soft closing, however there is one available (part no S600PB1SC), which is slightly more expensive. Hope this helps! A great package. Much cheaper than anywhere else and free delivery. Perfect for a smaller bathroom or cloakroom. Got my shower at the same time too. Recommended. Fantastic purchase quick delivery would recommend.